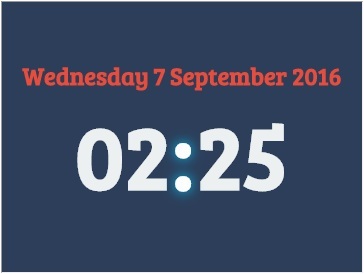 Display an accurate digital clock with HTML5 technology on your digital signage displays. You can easily customize this free digital signage app by modifying the hours, minutes, and even seconds to reflect the theme of your business. This content app can be cropped to fit aspect ratio 16:9 and 4:3; this feed can be customized to fit any zone size except for the header and footer. This content is best shown in the side banner on a horizontal screen. This content app can play for any duration.